You have a great product or service, but now your business success lies in your marketing. Content should be the heart of your marketing strategy. Through it, you’ll be able to educate and introduce your audience to new ideas, generate interest into a topic, or establish validation of a problem that businesses should be concerned about solving. Your content should be thought-provoking, inspire change, teach, and provide actionable, next-step recommendations. Content is most valuable as part of a multi-step campaign, and our White Papers are designed to fit into multiple stages within your campaign. The Ventana Research White Paper is an in-depth, authoritative content piece that provides a deep exploration of a topic using research and insights drawn from our benchmark research, and from the subject matter experience of our analysts. We provide an intensive exploration, usually 4 to 5 pages in length, covering a specific business and/or technology related issue with research facts and best practices that engage the reader. It is designed both to educate and to explore best practices and paths to optimal performance. We work with you to create an White Paper specific to your needs and goals. We do the heavy lifting to create a White Paper on a mutually agreed upon topic that speaks to your audience using our expertise and only our own market facts. Your organization will have exclusive distribution rights to the White Paper we create during the licensed period. In today’s dynamic business environment, competitive forces are putting pressure on companies to better understand their customers and how to serve them, to optimize their operations and control costs, and to rigorously address security risks and regulatory requirements.Properly applied, analytics can help in all these areas. 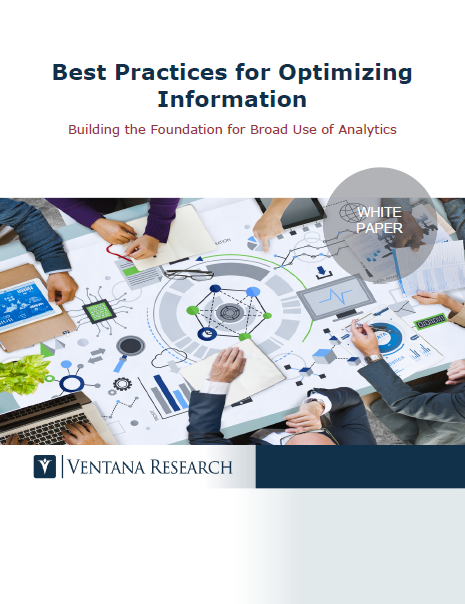 Research conducted by Ventana Research finds that among significant business technology trends analytics is organizations’ top priority, identified as such by 39 percent of research participants. CIOs and senior IT leaders such as directors of global applications and enterprise architects constantly face the challenge of reducing technology costs while continuing to deliver at least as much value to the business. The IT organization must always be seeking opportunities to automate the infrastructure and processes used throughout the enterprise to improve efficiency. At the same time, IT must continually enhance the application environment to modernize business processes and put more useful tools and information in the hands of those who produce business results. In other words, to ensure that CIOs and IT leaders are serving the business’s needs and satisfying its demands – and, not incidentally, maintaining their reputations – they must always be searching for ways to be not just more efficient but more effective. The employee experience is comprised of the interactions that employees have with their organization over the duration of their employment. Innovative organizations are focusing on employee experience management to help all employees excel at their jobs while feeling good about both their experiences at work and their contributions to the organization. Employee engagement matters. In our research on human capital management (HCM) and social collaboration, more than two-thirds (69%) of organizations said employee engagement is a critical metric.